This is the point in the flight where we begin to think about the descent and landing. We have certainly been flying in some turbulent skies as of late, but we are still on schedule to reach our destination. I am trying to juggle a lot of things right now. Financially, we are in the middle of a very significant budget building season. While we have received national attention for our efforts to freeze wages next year, we still need the acceptance of a few more groups to make it happen. Even with the wage freeze, we are going to be without at least 52 people next year. Important people. The planning has to begin to figure out how we move forward without them and without some of the programs that they were providing. While all of this is going on there is constant pressure from people to cut more, cut less, provide the same services but not increase taxes, increase taxes to keep programs, cut everything altogether, close buildings, and look to merge with other schools. There is only one word that can describe these times and surprisingly it isn't "stress", it is "composure". The plan has been, and will continue to be: to secure a wage freeze; cut 52 people who represent areas, programs and services; use $2.3M of our $4.425M in reserves; and levy a 4.8% tax levy ($70 on a home valued at $100,000) to balance the budget (8.6% is the levy allowed under a contingent, or failed, budget). The second part of the plan is to adjust to the loss of staff, plan to find a way to give staff appropriate compensation in the 2012-2013 school year, and already figure out how to close a $1.3M gap that I believe already exists for the 2012-2013 school year. Keeping composed during these times is key. We have many things to discuss and act upon if we are to remain viable as a school district over the next several years. We need composure to listen to ideas that we have never considered before because things have never been this bad. We also need composure to handle the media when asked to make negative comments about the Governor. I have nothing negative to say about the Governor. I agree that closing the New York State budget gap needs to happen. What I do not agree with is his assertion that we can do that in education without impacting people and students. We cannot. Just admit it and move on. The swim team has become Section III champions. The hockey team accomplished this feat as well during our mid-winter break. In the middle schools there have been some awesome Camillus Optimist Club speeches. In the elementary schools we just celebrated the first 100 days of school. DVD's of Beauty and the Beast should be available any day now for $10 each. I will be posting an additional budget update later this week as a few more pieces hopefully fall into place. Enjoy the week and see you around. As you might have heard, I presented our initial budget plan for the 2011-2012 school year at our Board of Education meeting last evening. This was by far the most difficult budget for me to discuss as it takes opportunities away from students and reduces staff in response to the Governor's proposal (the Governor has cut state aid to West Genesee by $5.63M for next year). Last week we met with 62 employees, from various areas, who will not be returning to the District next year in order to close this gap and balance our budget. We also evaluated our reserves and of the $4.425M that we have available to offset taxes, we are using $2.3M to balance the budget. On top of that we are actively discussing a wage freeze for all of our employees for one year. The reductions, the use of reserves, and the wage freeze result in a tax levy of 4.8%. A 4.8% tax levy represents a budget that is $1,611,925 less than this years budget and is also $1,114,866 below a "contingent budget" which is a budget that has not been passed by the voters. A 4.8% tax levy represents an additional $70 on a school tax bill for a home valued at $100,000. If we are not able to secure a wage freeze, or other factors that we are not currently aware of arise, the Board of Education will have to choose from a list of additional cuts that I provided them last night as well. While I do not endorse or recommend any of those cuts, we may need to consider some of them to balance our budget. I have posted a copy of the presentation on the District web site Budget Information page at http://www.westgenesee.org/teacherpage.cfm?teacher=1666. If you are interested in our budget and what the impact of the Governor's proposal has had and will have on West Genesee, please take a few moments to read it. The presentation represents everything that I know about the budget environment, the cuts, the tax levy, and further considerations. As always, if you have any questions please feel free to contact me. Back in 2003 I had the opportunity to see a high school production of Peter Pan at Arkport Central School. They had the flying apparatus, the licensed set, and the official Peter Pan costumes. It was the best high school performance I had EVER seen in seventeen years...until Beauty and the Beast this past weekend. Unbelievable. From my seat in the balcony I watched the scenes unfold. Bright coordinated colors, perfectly choreographed sets, and wonderfully precise costumes. The pit? Professional. Then came the students? More like professional actors and actresses themselves. I closed my eyes several times during the performance and realized that I could have been in a balcony on Broadway or Toronto and heard the same level of performance. I would challenge anyone to find a better sequence of "Be our Guest" anywhere in the country. Good luck. After the show was much of the same. Hundreds of little ones packed the hallways looking for a glimpse of their favorite characters. As Gaston, the Beast, Belle, Lumiere, and the others made their way into the back stage area to meet and take pictures they stayed in perfect character. I actually saw some of the younger children tear up after getting a chance to meet their favorite star. Stars they were, and are. Thank you for a great performance and for making some of our younger students feel so special! I am very proud of all of you. Beauty and the Beast erased the downtrodden feeling I had gotten at the Legislative Breakfast earlier in the day. This budget thing is going nowhere but downhill I am afraid, and the news we received from our elected officials was not pleasant. As the next weeks unfold you will begin to see the impact of the budget on our programs. I am hopeful that the first round of cuts that we made last week (62 full and part-time employees) will be the only round we will need to make. Lastly, I am currently sitting on a committee through the Town of Camillus Parks and Recreation Department that is looking at ways to maximize and possibly refresh all of the park areas in our community. We are also looking at ways to continue to leverage our own facilities at the school since the public helps to pay for those as well. There is a brief survey being administered through the Park and Recreation Department to assess from the community where the needs are. This survey can be accessed at https://www.surveymonkey.com/s/camillus-parks-and-rec-survey. Have a great week. I will post again on Friday before we head into mid-winter break. 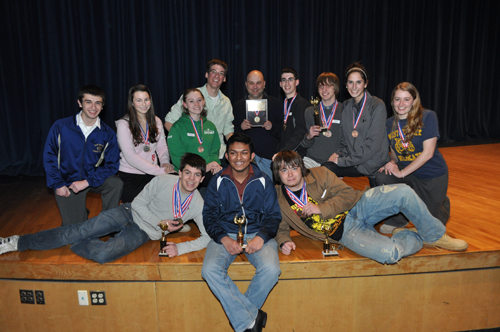 The West Genesee High School Academic Decathlon team won the Section III Championship. The Decathlon is no joke. Students have to take written tests and submit their brains to other forms of academic challenges. This was a great win for this team and for Scott Duda, their advisor, because they have been trying to climb into the top spot for three years and were able to make it happen. (For more information and a list of the participants and their medals, click here.) Their quest for the state championship will happen March 11-12 at Onondaga Community College. Congratulations! Also, our Science Olympiad teams did exceptionally well in their competition. While they did not win overall, they made some advancements that show promise for the future. I would like to thank the advisor Carm Priminano and all participants for a great showing. Beauty and the Beast will begin this Thursday. If you had the chance to see the preview on Channel 9 earlier this week, you saw poetry in motion. The student performers were, and are, spectacular. I cannot wait to attend the show on Saturday. Tickets are going fast for each show so please take the time to contact Bill Davern at 487-4612 to get your tickets (there is reserved seating for these performances). On the athletic side, I had the chance to watch our cheerleaders participate in the Sweetheart Classic in our gym on Saturday. There were teams from about 30 schools which made for about a 110 decibel performance area from about 7:45 a.m. until 6:00 p.m. Again, our students, advisors, and parents did a great job showing off our facilities, planning a wonderful event, and raising some money for charity and for their competitions that will happen in the next few weeks. Great job! Lastly, at Nottingham pool this Tuesday is a chance for our swim team to go undefeated, again! Bob Marks has taken his crew and has helped every single athlete on the team to contribute something to the cause. Best of luck and congratulations on another great year! Have a wonderful week. I will post about our budget development and some interesting options being considered at the state education department a little later in the week. The Governor has had his say. I understand everything he said about "righting the ship", "forging a new future", etc...I also understand his desire to reduce funding to schools. I disagree with his assertions that schools can close the gaps he presented through the use of reserves and pay freezes however. We do not have enough reserves to fill the gap for longer than a year, and a pay freeze nets the District only 20% of the gap we are facing. How big is the gap for West Genesee? Big. Well over $5M. There will be no way to close this gap and present a budget that is fiscally responsible to you without massive reductions to all areas of our operation. We are building a budget proposal that represents our best attempt at retaining opportunities for children while balancing the budget. I am in the process of notifying staff who will be affected by our budget reductions, and I will share more with the public once my staff have been made aware of the upcoming changes that we are going to need to make. I have other much more positive news to share, but I will do so later in the week in another post. The two paragraphs above need some time to digest. Thank you.